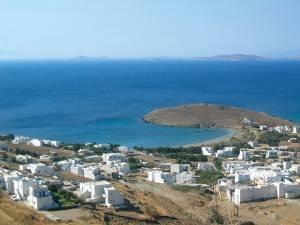 Six kilometers east of Tinos Town is the most well-developed resort area of the island, besides Kionia. The area which we generally refer to as Porto is actually two bays; the beaches on the longest of the two bays, though one contiguous long stretch, are variously called Ai. Sostis, Skilandari, Lauti, and Ag. Kiriaki. There's a fair amount of self-catering accommodation here, plus a few tavernas, and a mini market. The public bus from town terminates at Porto Bay, the second bay and where we have a concentration of high-quality accommodation. The sea bottom drops off very gently, and the beaches are superb for children.